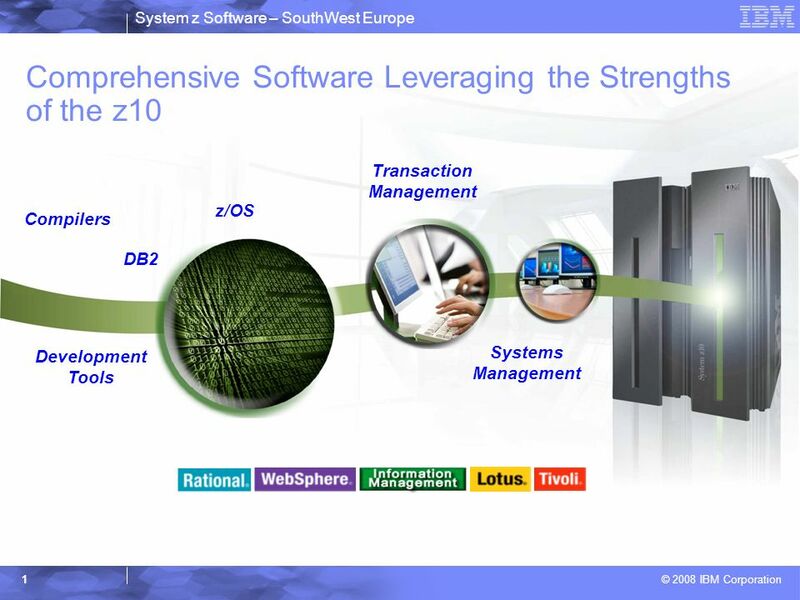 System z Software – SouthWest Europe © 2008 IBM Corporation 1 Comprehensive Software Leveraging the Strengths of the z10 Compilers DB2 Development Tools. 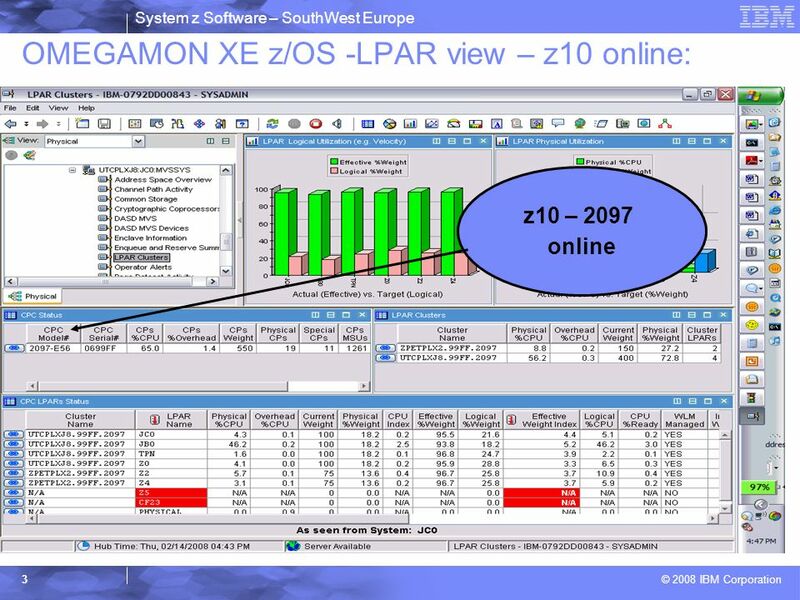 Download ppt "System z Software – SouthWest Europe © 2008 IBM Corporation 1 Comprehensive Software Leveraging the Strengths of the z10 Compilers DB2 Development Tools." IBM InfoSphere Classic Federation Server for z/OS Provide fast, automated SQL access to mainframe data Our understanding of your goals Simplify robust. © 2008 IBM Corporation System z10 The Cornerstone of the New Enterprise Data Center Mark Anzani VP System z Technology Deployment. 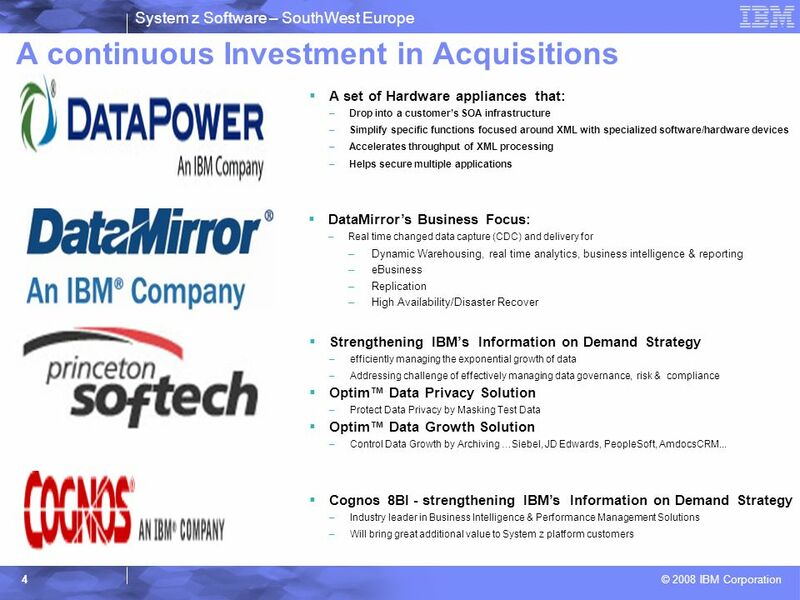 © 2009 IBM Corporation Data Warehouse Solutions on System z - Doing more with what you have! - Doing more with what you have! Beth Hamel Product Manager. 1 Copyright © 2012 Oracle and/or its affiliates. All rights reserved. Convergence of HPC, Databases, and Analytics Tirthankar Lahiri Senior Director, Oracle. An Overview Of Virtual Machine Architectures Ross Rosemark. Introduction to the new mainframe: Large-Scale Commercial Computing © Copyright IBM Corp., All rights reserved. Chapter 2: Capacity. IBM JIT Compilation Technology AOT Compilation in a Dynamic Environment for Startup Time Improvement Kenneth Ma Marius Pirvu Oct. 30, 2008. © 2013 IBM Corporation Complexity must be conquered (Data is more than “just” big) Laura Haas IBM Almaden Research Center 1. Priority Research Direction (I/O Models, Abstractions and Software) Key challenges What will you do to address the challenges? – Develop newer I/O models. CA Confidential; provided under NDA. © 2014 CA. All rights reserved.2014 Industry Analyst Symposium | 1 Evolving Role of Mainframe in the Dynamic Data. February 6, 2014 Ambuj Goyal General Manager, System Storage & Networking IBM Systems and Technology Group Why Infrastructure Matters. 1. Aim High with Oracle Real World Performance Andrew Holdsworth Director Real World Performance Group Server Technologies. Peter Plevka, BMC Software Managing IT and Your Business – Optimizing Mainframe Cost and Performance. © Copyright 2013 Hewlett-Packard Development Company, L.P. The information contained herein is subject to change without notice. HP StoreOnce How to win. Click to add text Introduction to the new mainframe: Large-Scale Commercial Computing © Copyright IBM Corp., All rights reserved. Chapter 3: Scalability. © 2011 IBM Corporation Smarter Software for a Smarter Planet The Capabilities of IBM Software Borislav Borissov SWG Manager, IBM.